BMW has just revealed another concept bike – that’s the third one this year, after the Path 22 scrambler concept and the Concept 101 custom bagger. The G 310 has only one goal: to promote BMW’s new entry level, small capacity bike that will be launched at the end of the year. 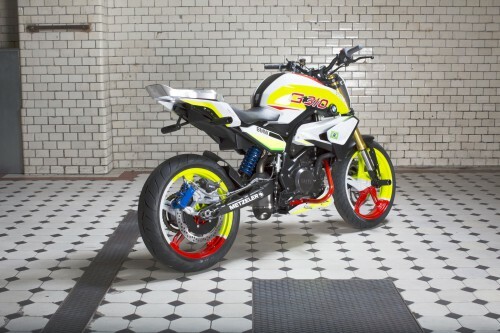 The Bavarian’s newest bike will take on the popular Kawasaki Ninja 300 and the Yamaha R3. 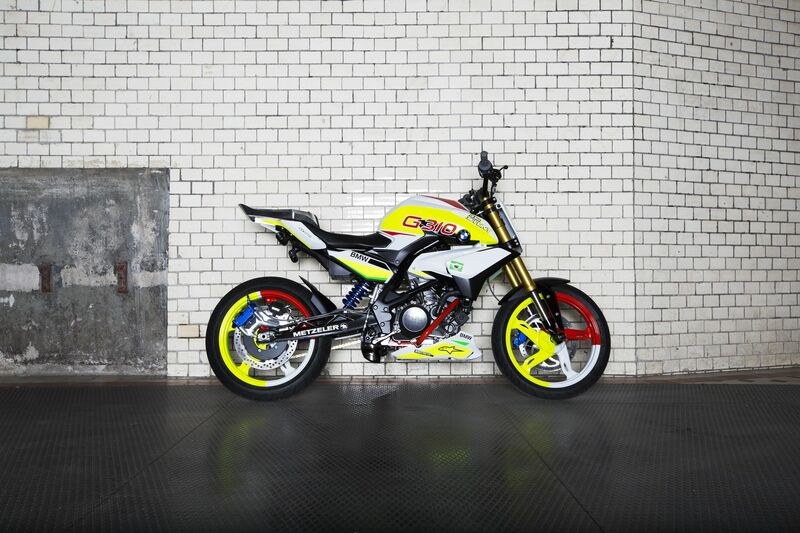 To speak about the G 310, it’s an agressively styled stunt bike powered by a newly developed 300cc engine. 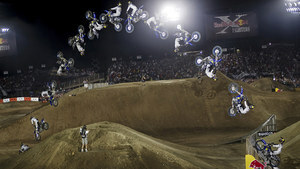 “Stunt riding is a demanding and multi-faceted sport. Ideally you need a compact, agile bike which is also stable and robust at the same time. You have to achieve the ideal balance between aggressiveness and control”, explains four-times World and European stunt riding champion Chris Pfeiffer. The BMW Concept Stunt G 310 combines all these qualities and makes clear at first sight: the newly developed 1-cylinder engine allows for very compact proportions thanks to its innovative concept. The special feature is the cylinder which is inclined towards the rear and the cylinder head which is rotated by 180 degrees. This permits optimum placement of the engine in the motorcycle and a short wheelbase in spite of the long swinging arm thereby making the motorcycle very agile. The low-slung front and the raised tail section promise fast and nimble changes of direction as well as dynamic riding. By shifting the intake area towards the front while also moving the exhaust system towards the rear it was possible to place the rear silencer in an upright standing position underneath the seat between engine and spring strut. In this way the silencer is optimally protected and does not limit the stunt rider’s freedom of movement. The numerous modifications are typical for a stunt bike; in making them Chris Pfeiffer brought his many years of experience as a stunt professional to bear in cooperation with the BMW Motorrad Design Team. 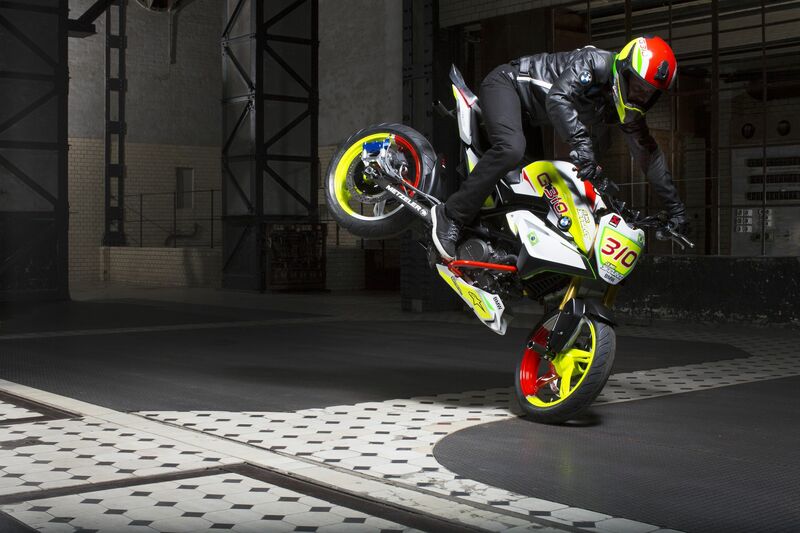 Their single aim is to provide the best possible handling properties for the stunt rider’s feats on the asphalt. 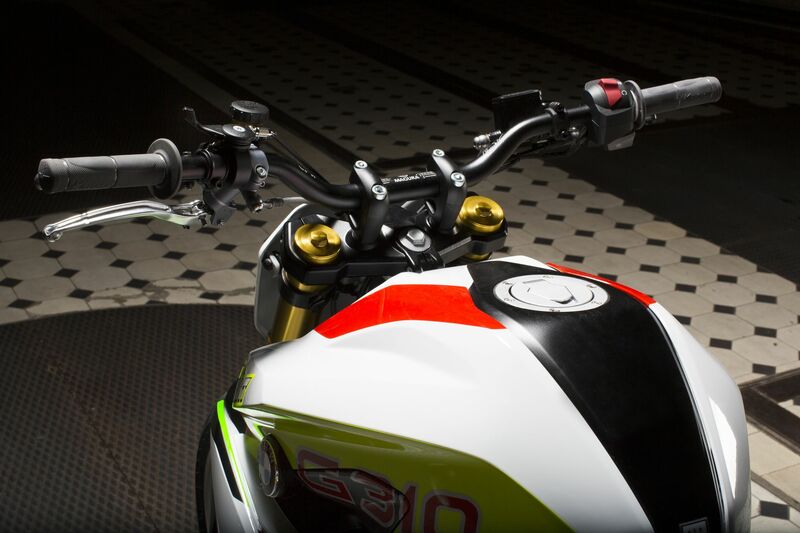 The lockable throttle ensures constant propulsion even when the rider’s hand has to let go of the throttle grip. In addition a slightly altered gear ratio secures greater propulsive force to the rear wheels at low engine speeds while the intentionally oversized rear wheel brake ensures reliable deceleration in every situation. 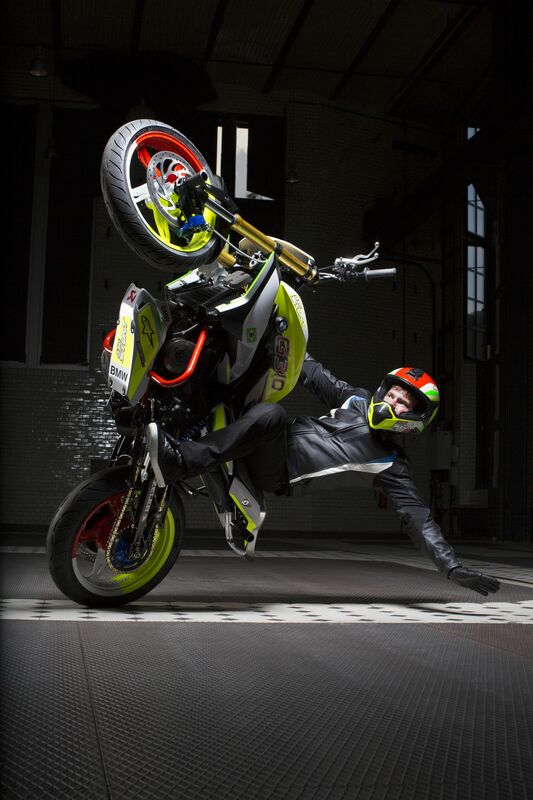 A second, even larger rear wheel brake allows the rider to brake the rear wheel using only his middle finger, in case his right foot is not on the footrest in certain stunts. The additional brake lever is specially placed on the left side of the handlebars and can even be operated at the same time as the clutch. So-called axle pegs on the front axle and in the seat area give the rider additional options for placing his feet which go way beyond the possibilities offered by normal foot rests. The distinctive red crash bars provide additional protection for the engine. 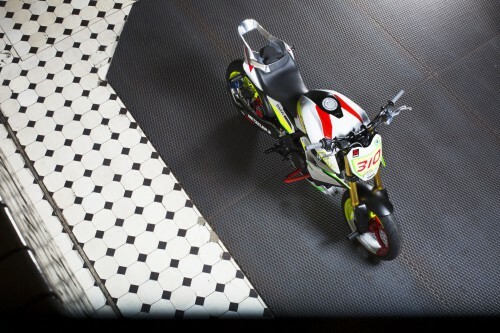 A special highlight on the BMW Concept Stunt G 310 is the “stunt tail” which was specifically developed by BMW Motorrad and which has not been seen in this shape on a stunt bike. It is milled from solid aluminium and features an opening in the centre, which offers the stunt rider a hold for his foot. Together with the non-slip seat, the aluminium component also ensures a stable seating position when riding thanks to its shape.